Wondering what kinds of questions your child will be asked on the TerraNova Tests? Here is a practice test with five sample questions. IMPORTANT: While the TerraNova practice questions shown on this page are representative of what your child will see on the exam, they aren’t taken directly from the actual test that’s being administered this year.For more TerraNova Practice, check out our 100 Free Questions. Look at the cake Beverly baked for Sam in the first box. Choose the picture that shows what the cake looked like after Beverly cut out the first slice. 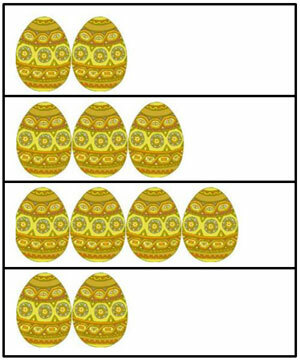 Choose the picture with the most eggs. Look at the boxes with coins below. Choose the box that shows 40 cents. Look at the picture below. It is a snake. I’m going to read some words to you. Choose the word that rhymes with snake. What rhymes with snake? Is it shoe, cake, cup, or snail? Touch the picture that shows where a family in New York City is most likely to live. It’s an outtdated test. They still have pictures of TVs with antennas. Most kids now think that is a robot. If your kid has to take this test, go to a private testing center and take another test in it’s place. The trajectory of your child’s education is important. Don’t let an out dated test that you won’t be able to review affect your child’s education negatively. TerraNova®, Third Edition is a registered trademark of CTB/McGraw-Hill, or their affiliate(s), or their licensors. TestingMom.com is not affiliated with nor related to CTB/McGraw-Hill or its affiliates (“CTB/McGraw-Hill”). CTB/McGraw-Hill does not sponsor or endorse any TestingMom.com product, nor have TestingMom.com products or services been reviewed, certified, or approved by CTB/McGraw-Hill. Trademarks referring to specific test providers are used by TestingMom.com for nominative purposes only and such trademarks are solely the property of their respective owners.